Because pulling espresso shots is a rather technical business, espresso terms make up many of the coffee jargon out there. Learn about espresso terms for espresso drinks, espresso machinery and more with this guide to espresso terminology. Each term is linked to a glossary entry with a definition, pronunciation guide and (in most cases) a photo. These are the core, classic espresso drinks you'll find on almost any coffee shop menu. Some are more recent in terms of coffee's history, but they are not so novel or new as, say, the mocha latte. Caffe Americano: a shot of espresso combined with enough hot water to fill a 6-ounce cup. Caffe Breve: espresso with steamed half and a half. Caffe Latte: a double espresso topped with steamed milk and foam to fill. Cafe au Lait and Cafe con Leche: espresso with milk, no foam, may include sugar. Cafe Noisette: espresso with a bit of cream. Cappuccino: single espresso with equal parts steamed milk and frothed milk. Espresso con Panna: espresso topped with whipped cream. Espresso Macchiato: a single or double espresso topped with a dollop of heated, texturized milk. Flat White: a shot of espresso and a double shot of steamed milk, no foam. Latte Macchiato or Long Macchiato: a half shot or less of espresso and the rest of the cup filled with steamed milk. 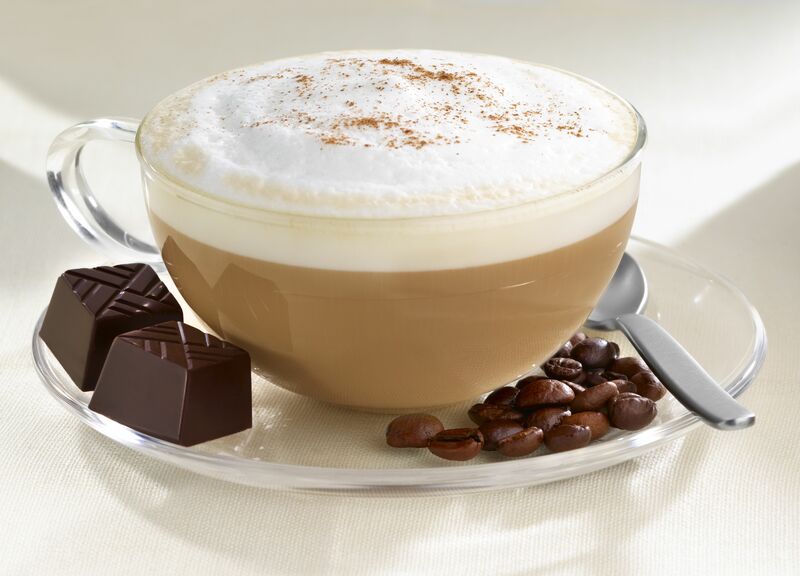 Caffe Mocha or Mocha Latte: a double espresso with steamed milk, chocolate, and foam. Dirty Chai: a shot of espresso mixed into a chai tea with steamed milk. Flavored Latte: a double espresso with steamed milk, foam, and flavoring syrup or powder added. Red Eye: a shot of espresso on top of a cup of brewed coffee. Double: twice as much, which can be applied to espresso shots, milk, flavoring, foam, etc. Dry: top only with foam, no hot milk. Lungo: A long pull, slower and more voluminous extraction. Ristretto: a short shot of espresso, just the first 3/4 ounce of an extraction. Shot: one ounce of espresso. Basket: this is where you put the coffee grounds to brew an espresso, which is then attached to the portafilter and locked into the head group. Portafilter: holds the basket to the group head during extraction. Group Head: the front of the espresso machine where the water is forced through the portafilter and the espresso is extracted. Boiler: where the water is heated. Conical Burr Grinder: grinds the coffee beans. Doser: attached to a coffee grinder, it doses out the right amount of ground coffee into the basket. Hopper: the part of the coffee grinder where the beans are held. Knock Box: technically an espresso machine accessory, it's where you dispose of the espresso grounds after extraction. Tamper (also an accessory): used to pack the grounds into the basket. Barista: the person who makes the espresso. Crema: the tan-colored foam on top of a shot of espresso. Demitasse: a small cup holding two to three fluid ounces, used for espresso. Mouse Tails: the drip of extracted espresso from the portafilter in two streams. Puck: the compressed cake of ground coffee through which the hot steam is forced to extract espresso.